A complete course for beginners, amateurs and professionals. Nine full routines you can use in real-world and professional conditions. More than 15 basic techniques! 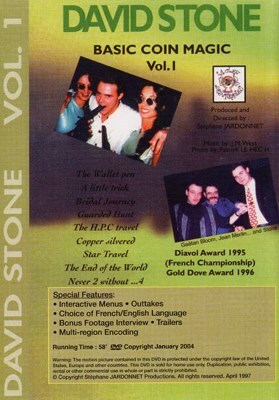 Multiple Awards winner (Diavol Award 1995, Gold Dove Award 1996...), the french magician David STONE performs nine routines in this dvd. All the routines are explained in step by step detail, along with closely guarded moves still used by the world's greatest coin magicians! Mastering Coin Magic is difficult : Attention must be paid to technique, timing, rhythm, body language....In this one hour long video, 15 moves and techniques are explained and performed in short routines that you can use in the real-world.. Each routine is detailed in a progressive explanation : First, you see the routine, then you learn the techniques used. You finish by a full explanation of the routine. 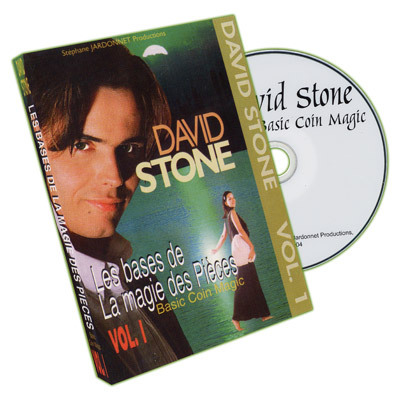 David offers more than just explanations, he provides you with a full progressive course on Coin Magic. Presentation has not been overlooked. Most of the routines explained in the tape are original : Old effects have been refreshed and performed in a new way. Professionally produced with multiple camera angles. Don't miss the tool that will change the way you look at Coin Magic ! The Wallet Pen: A coin disappears and re-appears several times from a pen cap! ( Classic palm and Classic palm Vanish). A Little Trick: A coin and pen disappear and appear alternately, being achieved through skilful bluffing. ( Finger palm and Finger palm Vanish ). Bridal Journey: Two coins are attracted by magic, illustrating the proverb "money attracts money" ! ( Kaps and Ramsay subtleties ). Guarded Hunt: David Stone's version of the "miser's dream" ( multiple coin production routine ) where a giant coin appears at the end ! (Transfer). The H.P.C Travel: Two coins magically jump from the left hand into the right hand, owing to the famous Han Ping Chien move ( Han Ping Chien Move). Copper Silvered: A copper coin magically changes place with a silver coin... into the spectator's fist ! The Copper/silver classic with regular coins (L'homme Masqué load and the Bobo Switch ). Star Travel: A four coins across effect (coins magically travel from one hand to the other). The End of the World: A coin appears in the hand of a member of the audience and is transformed into a giant coin ! ( the Spider Vanish, the utility Switch and an easy practical method to produce a jumbo coin ). Never 2 Without... 4: Four coins appear and disappear, creating a nice sequence owing to the successful game of illusion. No sleeves required! This routine has already charmed the most renowned magic authors. (Shuttle Pass, the Retention Vanish and another method to produce a jumbo coin ).